No longer do you need to spend tedious hours picking out cells manually. Select multiple areas and Stiletto automatically ablates cells inside each designated zone. Integrates seamlessly with your current workflow: no enzymes or extra preparation needed for your cell samples. Cleanly cuts colonies with minimal or no damage, and without burning or cauterizing. High speed separation of cells in colonies with an automated stage creates a uniform pattern or user-defined sections of size and shape for transplanting cells more easily into additional dishes or plates in the expansion phase of stem cell growth. Cells are handled in a non-contact manner thus eliminating any contamination. STILETTO Laser Module: 20x Objective and Class 1, infrared wavelength, 300 mW Laser combined into a single compact turret mounted unit. 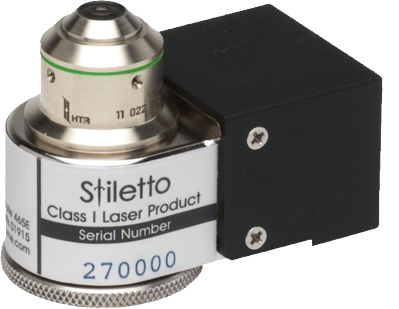 The Stiletto laser module installs on all current and older models of inverted microscopes. The LWD 20x objective is specially designed and manufactured according to high quality HT specifications. It is constructed to have high transmission in the infrared, as well as in the visible. Laser Controller: High speed micro controller with instantaneous closed loop laser power feedback control. 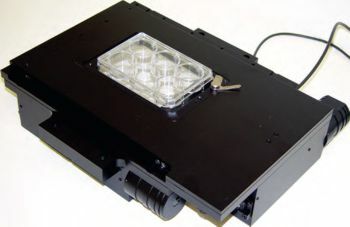 Microtitre plate holder for motorized stage: [Prior H223RNC] 85x128mm, recessed, for well plates with chamfered corners. Compatible with most 6-, 24-, 96- and 384-well plates. Digital (USB 2.0) color camera (max resolution 1392 x 1040). All Stiletto systems also come with the appropriate c-mount adapter for your microscope. A set of four turret adapters is included with each Stiletto. These adapters allow you install the Stiletto on any inverted microscope. Desktop computer including digital image capture board, all required cables, DVD-RW, mouse and keyboard. A 20 inch, flat screen monitor provides clear visualization of embryo and saves space on the workbench.